1. Mix 1 tsp fennel seeds and 1½ tbsp essential Waitrose olive oil in a large bowl. 2. 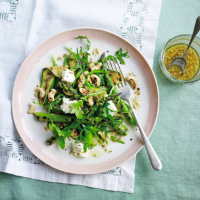 Snap the ends off 300g trimmed asparagus spears and very thinly slice 2 essential Waitrose courgettes. Toss the vegetables in the oil, season and cook on a hot griddle, on both sides, until tender. 3. Meanwhile, whisk 2 tbsp essential Waitrose olive oil in a large bowl with the juice of ½ lemon, ½ tsp soy sauce, ½ tsp essential Waitrose honey and 1 tbsp chopped flat leaf parsley. Add the warm vegetables and mix well. 4. Mix in 50g wild rocket, then sprinkle with 100g feta, broken into chunks, and 3 tbsp cashew nuts, lightly toasted.